Welcome to your first real look at the Huawei Mate 10 Pro, courtesy of Evan Blass. We can see the near bezel-free front, the two Leica-branded snappers on the back as well as the phone's design and color scheme. Mind you, the Mate 10 Pro is only one of the upcoming versions - along with Lite, regular and Porsche edition. If you zoom in on the image you can spot the f/1.6 aperture of the main camera. As for the strip that contains the camera equipment on the back, it has a lined pattern and could be glass. The brown color option is unique too. A similar design to this one has leaked before only then the colors included lighter blue and a red. 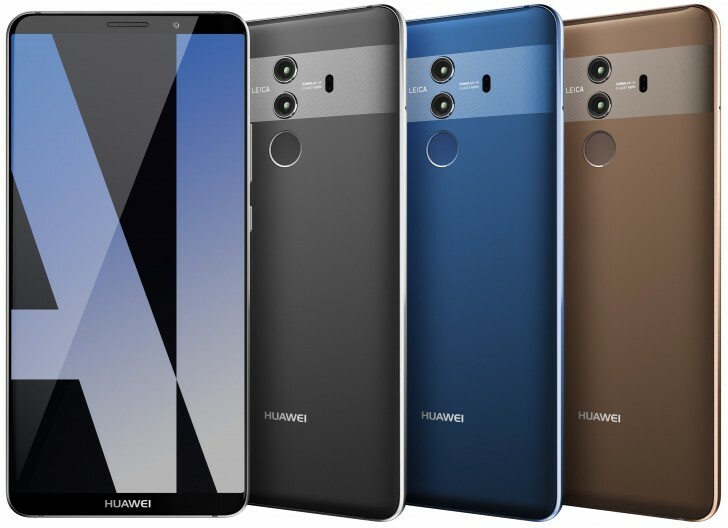 Huawei is expected to show off a total of four Huawei Mate 10's on October 16 - a regular Mate 10 with a 5.9-inch 1080p LCD, a Mate 10 Lite model that could pack a lesser Kirin chipset, the Pro and most likely a Porsche edition with the top specs and a classier design. In other news the new Kirin 970, which Huawei will premiere in the Mate 10 series, will have full USB-C audio with support for 32-bit sound. I see that you really pay attention to details. Not! the screen may look big but guess what so is the phone it hasn't cut the corners it is just another big phone nothing new here.